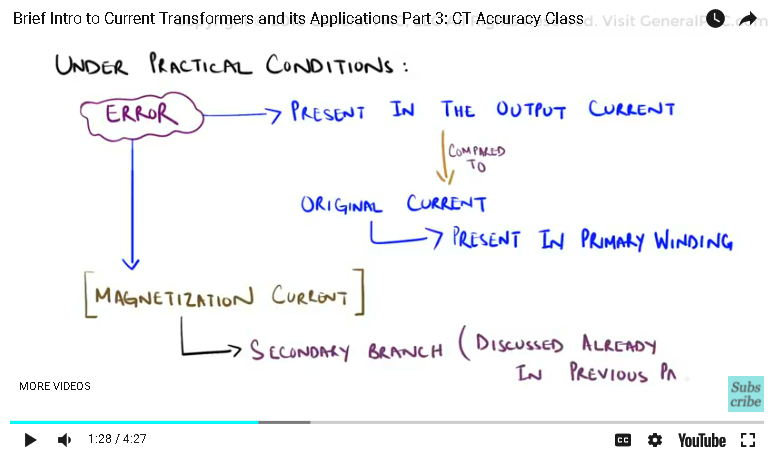 In part 2, we talked about the main characteristics of a Current Transformer with the help of an equivalent circuit model for an ideal CT. 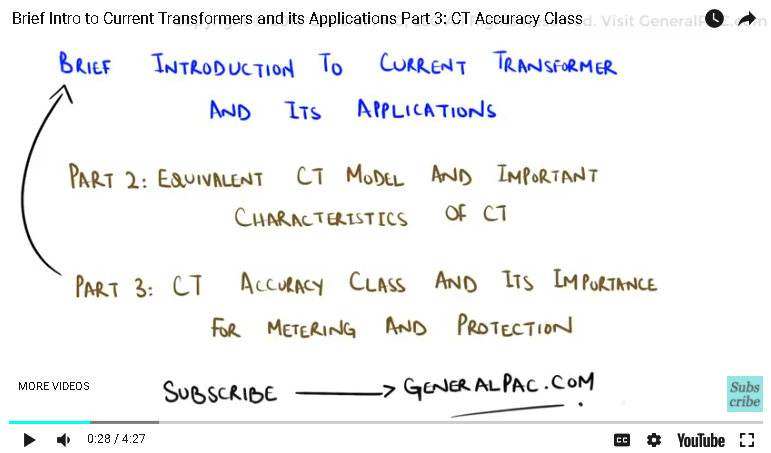 In this part, we shall briefly discuss CT accuracy class and its importance to metering and protection applications. Let us first define the meaning of CT accuracy in simple terms. It is the extent, to which the current present in the secondary side of a current transformer is able to faithfully reproduce the current flowing in the primary side. Under practical conditions, there will always be some error in the output current, when compared to the original current in the primary winding. The error is due to the magnetization current present in the secondary branch. This was discussed in more detail in previous parts. With the basic definition understood, let us consider the importance of CT accuracy for “protection”. 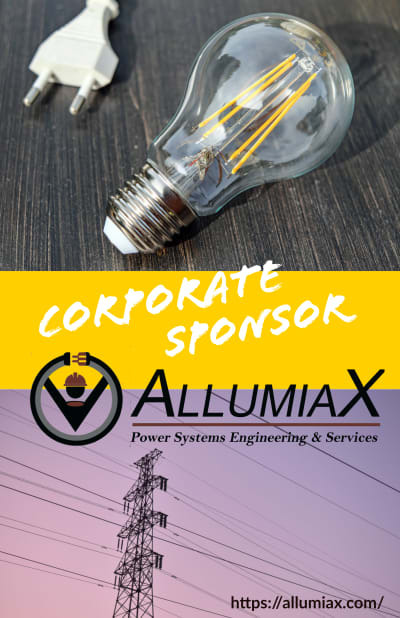 If we consider a fault on a low voltage bus in a 3 phase system, we would require the connected CT to be able to operate effectively at the highest current level present on that particular bus. 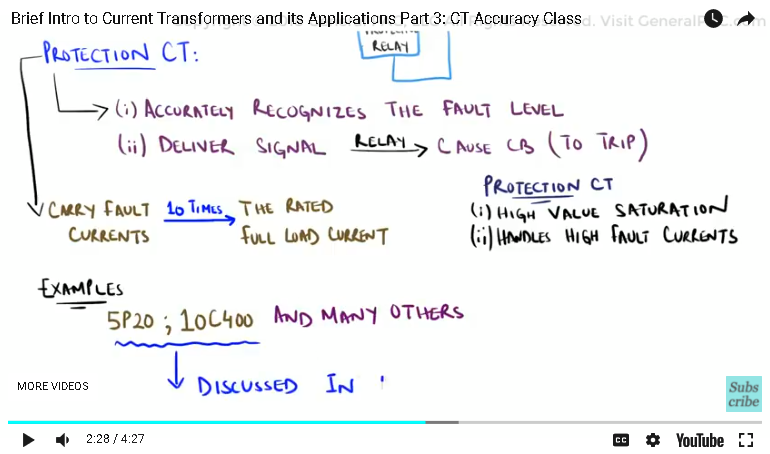 This is because we want the “CT” to accurately recognize the fault level, and deliver the signal to the relay connected to its secondary winding, which in turn would cause the “Circuit Breaker” to trip. For protection, CTs are required to carry the fault currents which can be “10” times the rated full load current. For this reason, we require protection class CTs to saturate at a high value, as this would enable the CT to properly identify the high fault level signature for protective relays. Examples of protection class CTs include the “5P20”, the “10C400”, as well as various others. We will be discussing these in more detail in later topics. 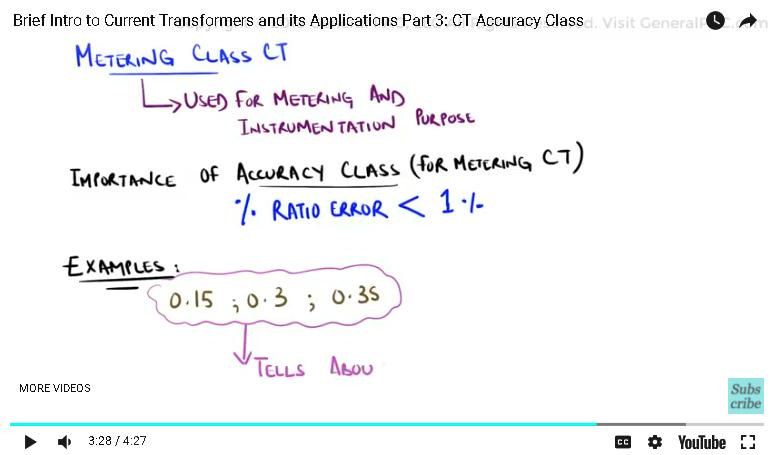 Let us consider the importance of CT accuracy class for “metering” purposes. We would want metering class CTs to accurately measure the current flowing on the primary side, to the full load current and beyond. These CTs are designed to have a lower saturation value. This is because under fault conditions, we do not want our metering CT to become permanently damaged. The lower saturation limits the amount of maximum current which can flow through the core, thereby protecting it from damage. These type of CTs are normally used for energy metering and instrumentation purposes. Since the accuracy class holds critical importance for metering applications, the percentage ratio error is only acceptable within a very small percentage… typically less than 1 percent. Examples of metering class CTs include “0.15”, “0.3”, “0.3S” and various others. These values tell us about the percentage error, which will be discussed in more detail in following topics in the series. To summarize the discussion, CT accuracy plays an important role for Protection and Metering applications. They are an important parameter to consider along with CT burden, sizing, polarity & saturation. In part 4, we shall talk about the importance of CT sizing and how it can be used to minimize saturation.